What story is your website telling about your business? The trick to finding this out is to put yourself in your customers' shoes. Customers usually visit your About Us page first, and then move on to your Case Studies or Portfolio page to check out what you've done for other customers. Your Case Studies page can help convince people that your company will be a good fit for them. Your Case Studies need a story; a list of bullet points isn't good enough. Bullet points miss out the 'juicy bits', for example if you're a web designer, its useful to talk about the initial situation (perhaps how awful the previous website was! ), the fact that it was built from scratch, how happy the client is now, etc. Before you start writing the story, think about who you're talking to. Who are they, and what do you want them to buy? It's useful to create a 'persona': who are they, where do they live, what keeps them awake at night, what do they worry about, how much do they already know about possible solutions? 1. The status quo: the hero is living in the normal world, but thinks there must be more to life. Luke Skywalker lives a quiet life with his aunt and uncle. This is the background of the 'ordinary life' of your client. 2. Call to adventure: the hero faces a situation that could alter the status quo. Luke finds Princess Leia's message. What led the client to contact you? Was it a problem that they can't address themselves? A supply issue perhaps, or a lack of knowledge in a particular area? 3. The hero finds a mentor. Luke meets Obi Wan Kenobi. The client meets you. (You should make the client the hero - you are the mentor). Talk about how you and the client got together, and remember that the client initiated the change, even though you actually did the work. 4. Challenges on the journey. 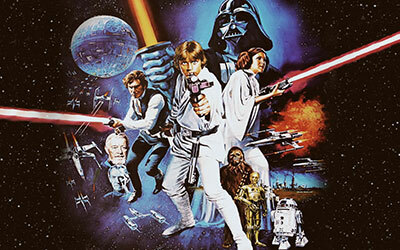 Luke joins the rebellion and faces multiple battles and adventures. This is the most important section of your Case Study. Talk about how you worked with the client to solve their problems. Mention any hazards in your way, for example tight timescales, legal constraints, lack of budget, and changing requirements. If you can see any themes in your challenges, group them together. Between three and six challenges should suffice. So by the end of this section, you have showcased your services AND shown how great you are to work with! 5. Triumph – the victorious hero returns. Luke destroys the Death Star and returns to a hero's welcome. What were the outcomes? For example when was the work delivered? Was it delivered on time and to budget? Do you have a continuing relationship and future plans? Don't forget that the client is the hero, not you. You are the mentor. So think of yourself as Obi Wan Kenobi! 1. Include testimonials (either on the Case Studies page, or on a separate Testimonials page). These are powerful, as you can demonstrate a direct link to the 'hero' to establish the truth of the story. 2. Highlight your case study with headings. Don't use big blocks of text as this will deter people from reading on. 3. Include some great pictures. 4. If your client has requested confidentiality, you can use this as one of your selling points. You can still tell your story without actually naming the hero or their business. Writing compelling words for people is one of things we do best. If you need a few words (or lots of them) for your website, brochure or other marketing materials, get in touch to find out how we can help.